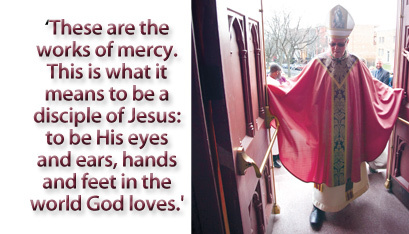 Have you walked through the door of mercy? Have you taken that big step of trust that Jesus invites all of us, as His disciples, to do, so that He can pour His divine mercy into our hearts? Doors often represent transitions. They are thresholds over which we cross from one kind of place into another: from the uncertainty and insecurity of the outside elements to the warmth and welcome of home and family; from an old way of just surviving to a new way of really living and thriving. The special church doors being opened throughout the world in this holy Year of Mercy are an invitation to open our hearts to a new level of trust in God's promises and, with the help of grace, to leave behind toxic, sinful patterns and relationships that disfigure our souls and stifle our human potential to be the heralds of the Gospel that each of us as a disciple is called to be. Trust is the key. If I freely and intentionally give over to God the best I have - my "first fruits," not just my "spare change" - and if am willing to leave behind my vices, bad attitudes and false attachments, the mercy of God will overwhelm me and fill me with the peace and courage to be an ambassador for Christ, a powerful agent of the Holy Spirit, renewing the face of the Earth. The beatitudes are lights that guide our path: "Blessed are the merciful, for they shall be shown mercy" (Mt. 5:7). This week, the 62nd annual Bishop's Appeal begins in parishes throughout our Diocese. Its theme, "His Mercy Endures Forever," is taken from Psalm 32 and echoes the call of Pope Francis, in this Year of Mercy, to renew ourselves as disciples of Jesus. We are called to be living vessels of His mercy and love! Jesus needs us to be instruments of His mercy in the way that He showed mercy while He walked the Earth. He even said we would do greater works than He did (Jn. 14:12). We all know how Jesus speaks of good stewardship in His parables, inviting us to care for God's creation, His creatures - especially the poor and vulnerable. So many good people like you throughout our Diocese do this every day, through gifts of time, presence and personal resources, both material and spiritual. These are the works of mercy. This is what it means to be a disciple of Jesus: to be His eyes and ears, hands and feet in the world God loves. In some ways, the title "annual Bishop's Appeal" can be a little misleading. As Bishop, I of necessity make this appeal very passionately, but no funds go to me - or, for that matter, to the diocesan corporation for its own sake. The Bishop's Appeal is more of an annual stewardship appeal. It is not about giving money to "the Church" that just enriches its institutional coffers. It would be contrary to the Gospel to take and store up treasures without giving. Instead, the Bishop's Appeal is about connecting each of us as disciples-in-mission, good stewards, through the body of Christ, His Church, with real people whom Jesus wants to reach. These people will not know His touch without our personal and sacrificial giving. The appeal is the door through which God's mercy flows from our hearts through His heart and into the hearts of those most in need of His blessings. How, specifically, does your gift bring the mercy of Jesus to others? We have agencies that "deliver the goods" to beneficiaries who clearly need those services. Here are just three examples. Bishop's Appeal funds support food pantries, soup kitchens, emergency assistance, service to vulnerable populations, seniors and their caregivers, pregnant teenage girls (through prenatal care and delivery and the development of parenting skills), services in rural counties and at-risk children at Troy's Sunnyside Center. We educate almost 5,400 students in our diocesan system of schools. Our schools provide competitive academic programs that ensure high school and college readiness. Ninety-six percent of our diocesan high-school graduates go on to higher education; another four percent to other advanced programs, including the military. Most importantly, research continues to show that Catholic schools are the best means of assuring not only that the faith of our young people is well formed and handed on, but that we also form good citizens. As the child is taught, so goes the nation. The future of priestly vocations in the Diocese of Albany is promising. We currently have 14 seminarians (the Bishop's Appeal pays for their seminary education), five aspirants and more than 90 men throughout the Diocese actively discerning a vocation. These goals and others give us good immediate reasons for giving. They are clearly material goals, but they bring spiritual benefits, as well. How many lives will be changed by these acts of mercy! There are further reasons, in addition to the fact that the needs are there or that this is just something that we disciples of Christ do as good stewards. An even more profound reason is a simple matter of justice: We want to be merciful to others just as God has been toward us. Psalm 116:12 says, "What shall I return to the Lord?" These words invite a response to God's generosity in our lives. God gives each of us gifts that are meant to be developed, shared and returned to the Lord as we help to build the kingdom. Jesus gives us another serious motivation: He reminds us that it is essential to our salvation to detach ourselves from our possessions so that He himself can be the center of our lives, not our false sense of security, which can collapse at any time. We know the story of the young man who followed all the commandments but could not part with his wealth: Jesus looked at him with love, but he still ended up walking away from Jesus, who was opening the door to His heart. The young man was afraid to take the next step and walk through the door of mercy. He trusted his own possessions more than Jesus Himself. This leads us to perhaps the best reason for being especially generous in this Year of Mercy: We are being asked to accept the message of Divine Mercy for which the prayers and pleas of so many of our recent Holy Fathers have been preparing us. Pope Francis invites us to walk through the door of mercy, saying: "Lord Jesus, I trust in you!" This trust is not completely blind, because we will see many of the results of our works of mercy. But the material and spiritual rewards that will come to us personally may well be a surprise. God's generosity to us can never be outdone. Plus, we will be building up our solidarity with one another, especially our brothers and sisters most in need. This is the best form of Church-building. We belong to one another! As you respond to God's generosity in your life and trust in God's mercy, all in the Christian community will grow closer to what Jesus intended for the world. I recently consecrated myself and our whole Diocese to the immaculate heart of Mary. I appeal to our Blessed Mother to direct all that is given and all that is received from and to those she and her Son so desire. May our God, the source of all good gifts, continue to bless you and your family as you join with others in your parish community and with your sisters and brothers across the Diocese in going about the very important work of building up the kingdom of God. Walk through the door of mercy!